I just realized that Valentine’s Day is 3 weeks away! I had better get started on the planning if I hope to do anything special. If you’re someone who just loves to celebrate Valentine’s day, I’ve got a great list for you! I’ve gathered a list of the absolute best romantic valentine’s day food. Ground beef recipes are always good to have on hand, aren’t they? Ground beef pairs well with so many flavors and foods and lends itself to lots of interesting dishes. From new twists on old favorites to skinny options for lunch or supper, I think you’ll love these ground beef recipes and I’m sure they’ll become some of your favorite go-to meals. Summer grilling season is coming! Made these delicious BBQ Cheddar Burgers this weekend for the family. They are topped with Kraft Mesquite Smoke Flavored Onion Strings for an added crunch. 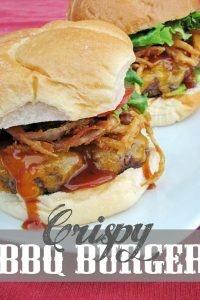 I am sharing the recipe for Crispy Onion BBQ burgers on the blog today so check them out!